These delicious easy Lemon Bars are quick to make and will disappear in no time! Picture a sweet, tangy lemon filling on a buttery shortbread crust. Gluten-free and refined sugar-free options are included. Today’s post for easy lemon bars is a little different than usual. I’m participating for the first time in a fun blogger event called the Secret Recipe Club! Each month, a blogger is secretly assigned another blogger and chooses a recipe to make. On reveal day (today, you guessed it! ), all our posts go up at the same time and we discover who was assigned our blog and which recipe she/he decided to try. 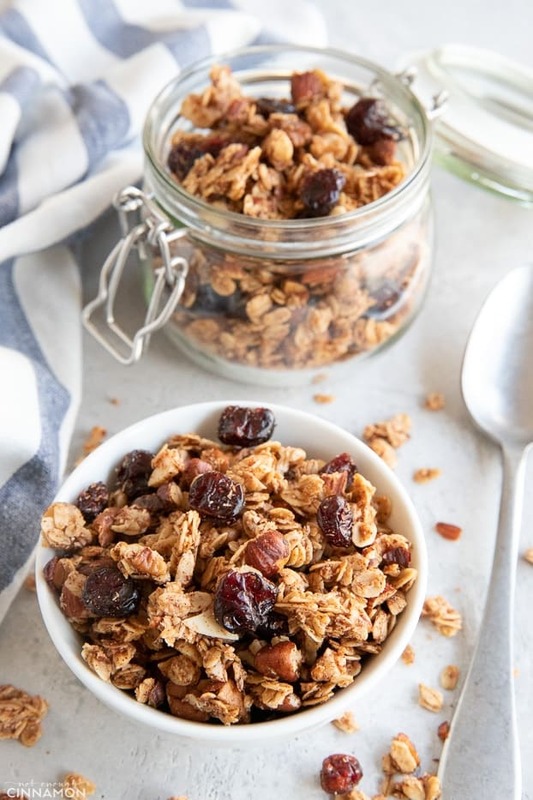 I love to discover new blogs and new recipes so I was anxious to join the club! This month, I was assigned the blog Sweet As Sugar Cookies, written by the lovely Lisa. If you couldn’t already tell by the name of her blog, Lisa LOVES sweet treats. Cookies, cakes, pies, bars, breads…you name it, it’s on her blog. I honestly had a hard time choosing a recipe, I just couldn’t decide. Too many delicious options! I was very tempted by this Cranberry Orange Gingerbread, these Eat Healthy Ginger Cookies or these Triple Cinnamon Crunch Biscotti (obviously!) but I finally settled for the Lemon Pie Bars. I just love anything lemon curd and so does my mum, who was visiting us at the time. 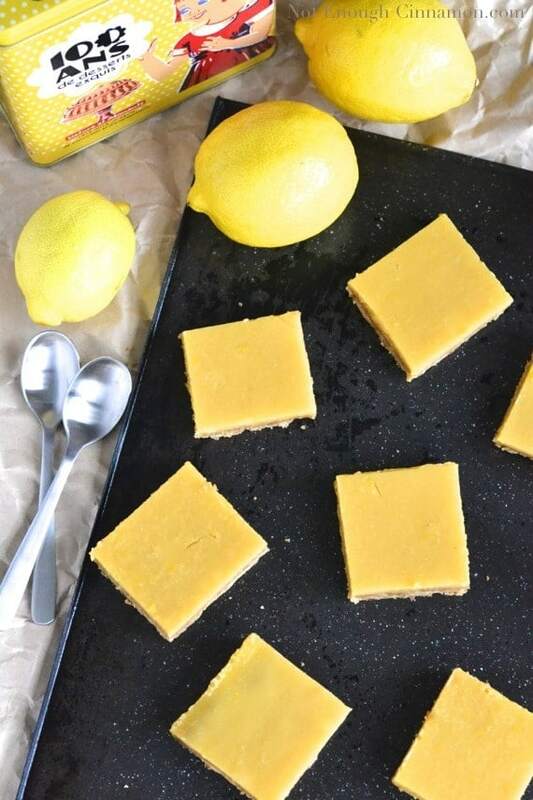 You know me, I had to “healthify” these lemon bars a little bit so I swapped a few ingredients but this recipe is a winner. For my recipe, I opted for gluten-free flour and used coconut sugar instead of white sugar making these easy lemon bars gluten-free and free of refined sugar. Of course, these swaps are up to you and you can just as well use regular sugar and flour. 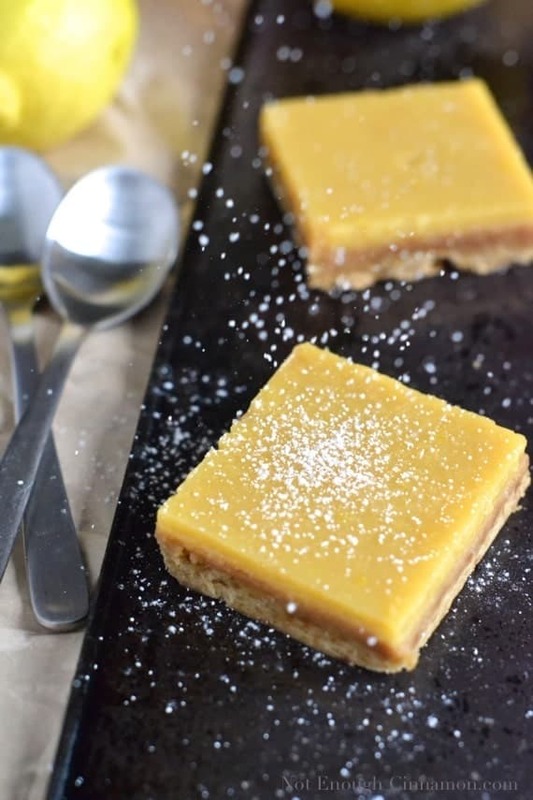 If you tried these easy lemon bars, don’t forget to rate the recipe below and let me know how it went in the comments – I love hearing from you! You can also follow me on Instagram, Pinterest and Facebook for more deliciousness and behind-the-scenes! These delicious Lemon Bars are super easy to make and will disappear in no time! 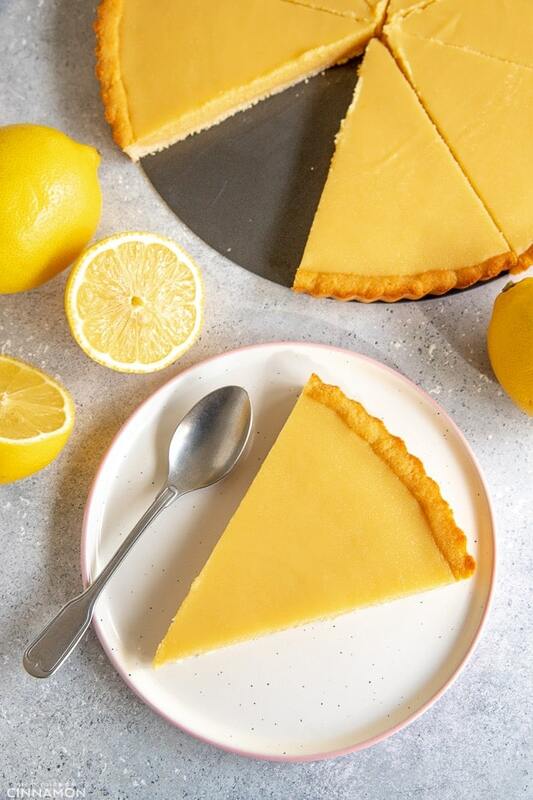 A sweet, tangy lemon filling on a buttery shortbread crust. You are going to love how quick this easy dessert recipe comes together. Gluten-free and refined sugar-free options included. Combine flour and coconut sugar (or powdered sugar if using). Cut in butter. Mix well until the dough is forming and butter is completely incorporated. I started with my hands and finished with a wooden spoon. Press the dough into the pan. If the dough is too sticky, wet your hands slightly. Make sure the dough is evenly spread in the pan. Beat together eggs, sugar, flour, lemon juice, and lemon zest for at least 1 min. Pour the mixture over the baked crust. Bake the bars for another 15-20 min., or until the lemon topping has set (mine took 15 min.). Remove from the oven, let cool completely and store in the fridge for about one hour before cutting into squares and serve. These bars are delicious as written but next time, I will probably double the filling to have a thicker lemon layer. Oh my gosh, I had forgotten all about this recipe. Thanks for reminding me about how good it was. I’m so glad you enjoyed them and I think it’s so neat that you made them gluten free. Loved your sweet words. Wow what incredible bars these are – So neat and precise. Its my first month over at #secretrecipeclub too – nice that we can be newbies together! Welcome to the Secret Recipe Club!! 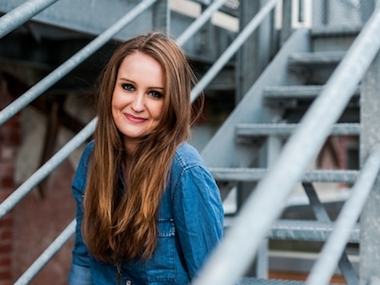 Delighted you have joined us and I can’t wait to discover more about you and your beautiful blog! 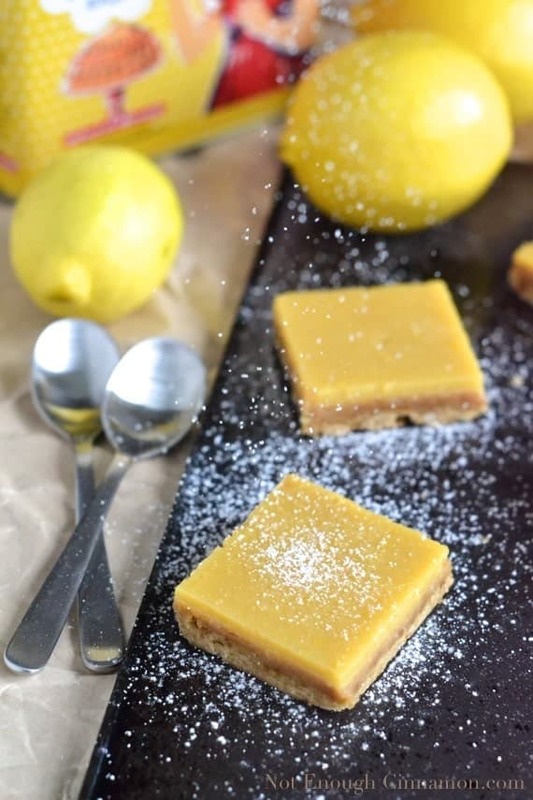 I love lemon bars – these look so good! Me too, I’d probably have some every day if I could haha. Thanks for stopping by Danielle! Your bars look wonderful! Welcome to SRC! These look yummy! I love anything lemon. Welcome to SRC. It is a lot of fun! Wow – I love how the yellow just pops off the screen. 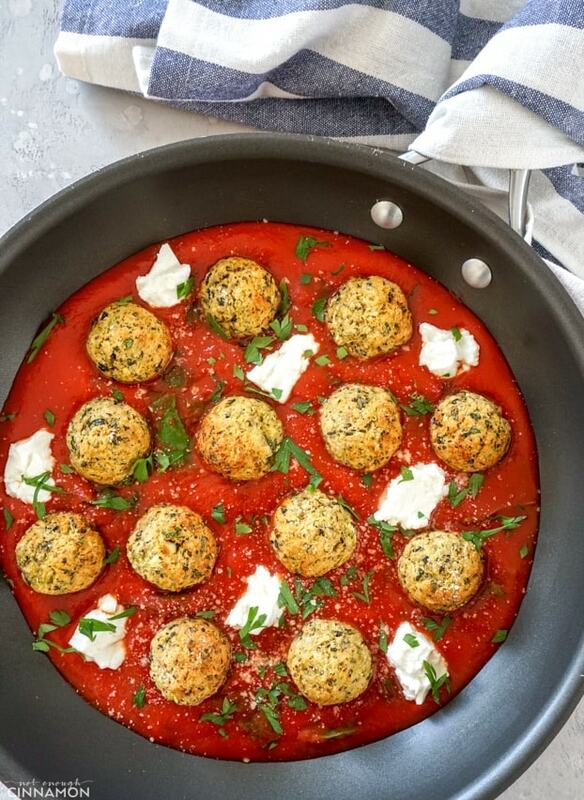 Love your adaption to the recipe..delicious! 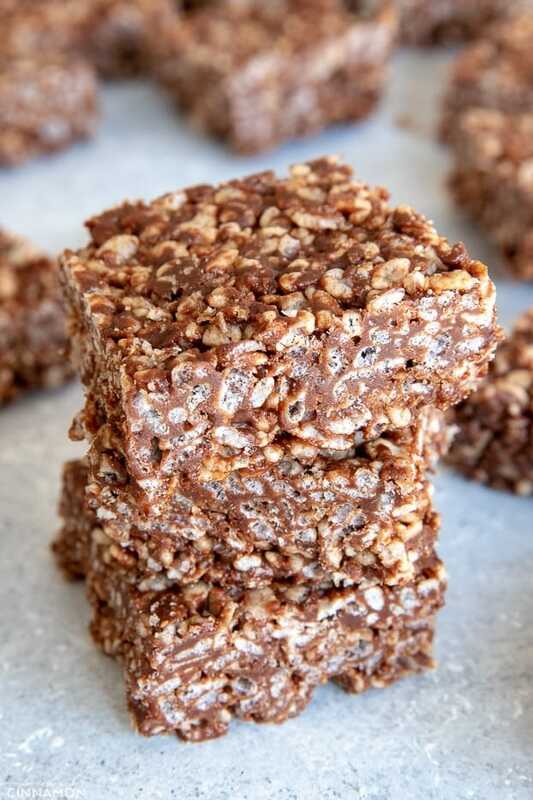 So glad to have you in Secret Recipe Club – these bars look incredible. I especially love that first shot with the powdered sugar. MMM! Happy first reveal day and welcome welcome!! Wow, these look amazing! What a great recipe! I JUST bought some lemons, so this seems perfect for me! These look SO delicious and the recipe seems to be pretty straightforward as well. Must-try!